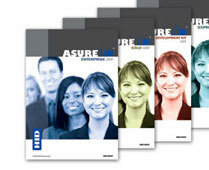 HID Global announced the launch of Asure ID 2009 card personalization software. The software enables users to control how data is sequenced and entered on to the card. The new software is designed to improve the speed and throughput of enrolling cardholders and making smart card development and deployment simple. The latest software incorporates familiar Microsoft Ribbon-like controls that are designed to make ID card design, data entry and data management easy. The software is built on the Microsoft .NET technology platform and available in four editions. The ability to preview fully designed cards on-screen prior to printing. Asure ID Solo 2009: Entry-level card personalization software, Asure ID Solo provides processes for card design, a configurable data entry center, streamlined card production with dual-sided printing capabilities and basic database functionality to save records. Asure ID Express 2009: This standalone card personalization software offers advanced card design, a configurable data entry center for quick card production, and basic external database connectivity, allowing for real-time data exchange and batch and sheet printing capabilities. Asure ID Enterprise 2009: This networkable edition allows multiple workstations to share a common database that enables users to connect for real-time data exchange. This edition also offers a configurable data entry center and batch and sheet printing. Asure ID Exchange 2009: Designed for the most sophisticated secure credential applications, this networkable edition provides advanced smart card functionally supported by the iDIRECTOR encoding and management module, as well as the ability to connect to a wide range of external databases with Live Link for real-time data exchange. It also features a configurable data entry center, intuitive card design processes and batch and sheet printing capabilities.